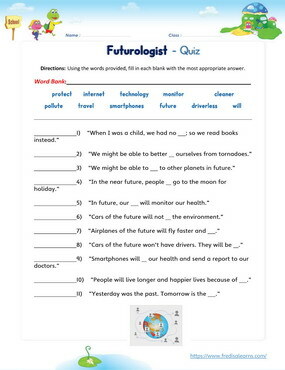 Teach English learners how to talk about the future using the future tense. 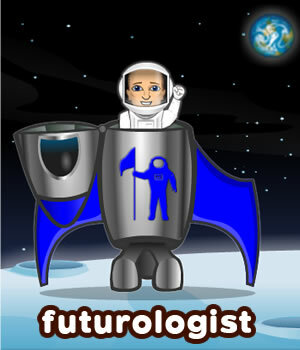 Teach ESL/EFL learners the use of ‘will’ and ‘might’ when talking about future possibilities. Teach English learners that ‘won’t’ is the contracted form of ‘will not’. 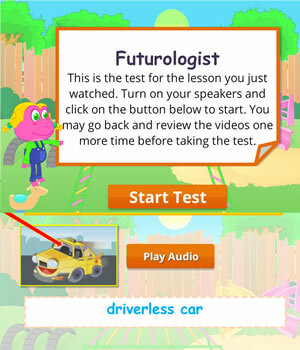 Teach a few new words relating to modern technology with this ESL kids lesson. The worksheets below are useful for offline and classroom activities. 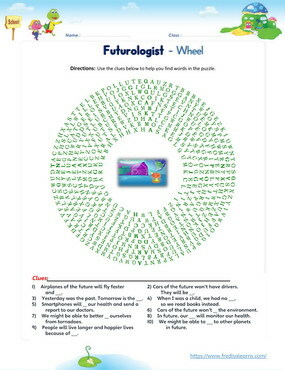 These printable exercises directly correlate with the above lesson 'Futurologist'. Every worksheet comes with an answer sheet on the second page for educators. Dad takes Lisa and Freddie to the Science museum where they have a conversation about how technology will change the future. Lisa is surprised to learn that when Dad was growing up there was no internet. Lisa wonders how they lived without the internet. Dad tells Lisa, they read books instead. Dad also tells them that technology is always changing. They discuss other future possibilities. Our smartphones will become even smarter in the future. Smartphones of the future will be able to monitor our health. People will live longer and happier lives because of technology. Planes will fly faster and cleaner in the future. Cars of the future will not pollute the environment. Cars of the future won’t need a driver. They will be driverless. We might be able to better protect ourselves from tornadoes. We might travel to another planet. We might be able to find life on other planets. Freddie: Where are we going, Dad? Dad: We are going to the Science Museum. Lisa: Why are we going there? Dad: Science is very important. I want you to learn about it. Dad: Did you know, when I was a child, there was no internet? Freddie: How did you survive? Dad: We read books. Technology is always advancing. By the time you are my age, there will be new things, too. Dad: Well, for one. Our smartphones will be even smarter! Freddie: What will they be able to do? Dad: Well, I predict that they’ll be able to analyze your health. You’ll put your smarter phone in your pocket and it’ll tell you how your body is doing. Lisa: That would be very helpful! Freddie: I bet it would alert you if you were about to feel bad. Lisa: I wonder how technology for tornadoes will change in the future, Dad. Freddie: Yeah. I wonder if we will be able to stop tornadoes before they get here. Dad: Maybe not, but we might be able to stay better protected. Or to predict when they are coming. Lisa: That would be very good. Freddie: Technology is a good thing, isn’t it Dad? Dad: Yes, Freddie. Technology helps people live longer lives. Freddie: Mom! We had a great time today. Mom: What did you learn about? Lisa: We learned about technology and the future. Freddie: And why it’s important. Mom: Why is it important, Freddie? Freddie: Technology makes things easier for people. It helps us live longer and happier lives.